Fairest is the story of the evil Queen Levana, and the prequel story for Marissa Meyer’s Lunar Chronicle series. For those not familiar with the series it contains three full length novels (Cinder, Scarlet, Cress), two short stories (Glitches, The Queen’s Army) and now a short novel with Fairest. The final novel, Winter, is scheduled to come out the Fall of 2015. 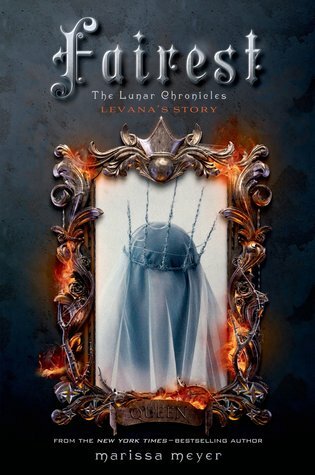 The Lunar Chronicles is a science fiction re-telling of the classic fairytales Cinderella, Little Red Riding Hood, Rapunzel, and Snow White. I received Fairest as a birthday gift and initially began reading it in February. You may be surprised it took me so long to finish the novel considering how much I love the other books in the series, but I just couldn’t get into the story. This has nothing to do with Meyer’s writing and story development. Her writing is good and the story moves well. It has everything to do with Levana as a character. I just don’t like her because I have never been fond of the Evil Queen despite her many reincarnations over the last ten years. Charlize Theron’s portrayal is by far my favorite, though I was less than impressed by the Snow White and the Huntsman film. Anyways, a story about the Evil Lunar Queen wasn’t going to be my favorite of the series, but I still wanted to read it. It should have been half the length, a novella instead of novel, because we spend far too much time delving in to the frantic, and often childish thoughts of Levant, resulting in her seeming more whiny instead of powerful and terrifying. I loved the glimpse into her psyche; how lost and confused she was, how desperate in her love, and how much she hated herself. I just wish the power of the final scene with the mirror resounded through the entire story. Have you ready Fairest? What is your favorite story in the Lunar Chronicles? Now for the review of the Lunar Chronicles prequel, Fairest! I will not be rereading Fairest this month. It’s my least favorite of the series but I still recommend reading it at least once! Enjoy the review and have a great Saturday!